People are so wonderfully creative. Susan Stockwell, UK artist, specializes in ... well... many things, but at the top of the list I would put "creative use of unusual materials". And she uses a lot of coffee and tea, which I think is just grand! 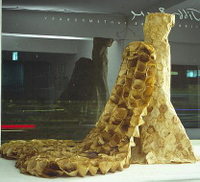 This goes in the category of "dress work" - the train of this life-sized dress was stitched together from used coffee filters. The dress itself is coffee stained waxed paper cups, sewn together. Pretty amazing. And if you ever run out of coffee filters... no, I guess you wouldn't want to pilfer from this piece of art. She's also fashioned a beautiful Victorian style dress (can I borrow this for an afternoon tea party?) made out of old maps of the British Isles. She does a lot of map-art. Stuff made out of maps. Maps made out of ... stuff. In addition to this map of India, made entirely of tea bags stitched together, she's got several versions of the world: here is a map of the world, painted with coffee on coffee filter paper and here's the world painted with tea on tea bag paper. Here's a map made with a tea stain. 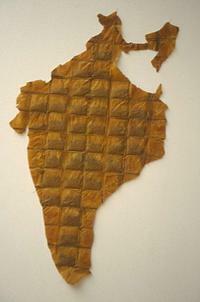 And here's a map of the America's made with coffee filters glued together. You have a great ability for building fun sites, I just came from your other site and was enjoying the progression photos of your paintings, yet it didn't seem to have any recent entries. have you left it for coffee? (not that -that is bad) some day i will have to share my painting of morning fairies sitting on the edge of a coffee cup And yes... all painted in different strengths of coffee and tea. My blog is real new but check it out, I think it will speak to the artist in you. Isn't that cool? I've thought about using maps for decoupage etc, but I've never thought of making maps out of other stuff. I just love creative people! I love the map work.